All summer long, I have been obsessing over the stunning eggplants at the farmers markets. Beautiful shades of light and speckled purple, striped and red and blank white. I never picked up a single one because I was totally uninspired as to what to do with them. Then I saw Sarah’s beautiful Heirloom Tomato Eggplant Caprese Stacks. They looked bright and summery and craveable and reminded me of a strained yogurt and spicy tomato eggplant thing I used to make. I don’t know what it was called, or even where I got the recipe, but I do recall that it was of Middle Eastern origin. And I had recently acquired a generous amount of sumac, my favorite all-time Middle Eastern spice. I think I like sumac even better than I like thyme. So sumac + eggplant + farmer’s market whatever = fattoush something. I used these pretty Dancer eggplants, shining in a lovely amethyst hue. After roasting, they were so creamy, almost melting on my tongue. I never want another supermarket eggplant again. But I’ll probably change my tune once the farmer’s market closes for the season and I’m huffing around the Kroger produce section, kicking at the wheels of my cart. I actually like Kroger produce, but nothing can ever compare to fresh-from-the-dirt. There is a nice tomato-headed kid who always helps me out, showing me cotton candy grapes and such. Digging up the plumpest Brussels sprouts when he catches me poking at the bruised brown-leaf ones. So I guess going back won’t be so bad. Maybe. Since I love sumac so much, I made a pseudo-hummus out of lemons and chickpeas and sumac. A little garlic and salt. It really brings makes the Middle Easter flavor spark, like a hot hum of the last days of summer. I used beautiful Dancer eggplants, a gradient white-lilac variety known for their low bitterness. If you use darker eggplants such as Nadia, Galine, or Traviata, you may want to increase the salt-and-sit time to 20-25 minutes. Cut the eggplant into 1/4 inch slices. Sprinkle both sides with salt and allow to sit for 15 minutes. While the eggplant is baking, blend the chickpeas, lemon juice, garlic, and sumac, into a smooth paste. Add salt to taste. Spoon on a layer of the chickpea-sumac paste and delicately spread. Add layers as follows: cucumber, radish, sprinkle of parsley, sprinkle of green onion, tomato, sumac paste, cucumber, radish, parsley, green onion, tomato, sumac paste, and then top it all off with the remaining eggplant. 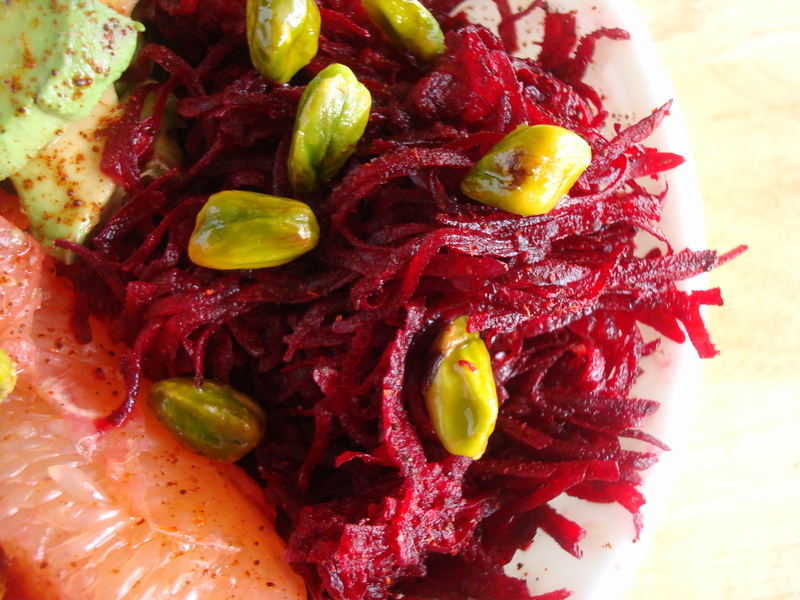 Sprinkle with sumac and garnish lightly with additional radish, parsley, onion, and cucumber. Serve with pita or soft corn tortillas. Silky raw “fried” avocados, the best summer produce, and a creamy low fat vegan dressing come together to make this yummy salad. 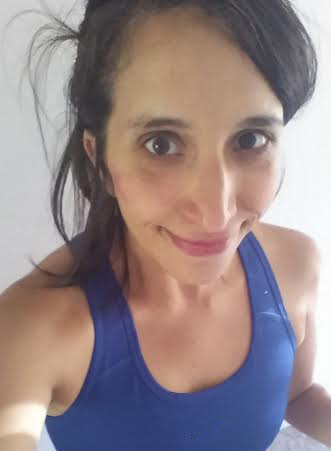 Earlier this week, I went to TJ Maxx in search of some work dresses and running gear. Save for an eight dollar pair of shorts, I found neither work clothes nor sweat-in clothes. That’s how it usually is at TJ Maxx-y type places, you either find armfuls of cute outfits or nothing at all. This was a nothing-at-all day. I didn’t leave totally empty handed, because I wandered over to their random foodstuffs section and kinda hit the jackpot. Saigon cinnamon, Himalayan salt, peanut butter powder. And best of all — hemp hearts! I usually don’t buy hemp hearts because they are rather pricey, but these were so discounted that I just had to have them. Funnily enough, a few days later, I came across this article in Bon Appetit, all about how our TJ Maxx food purchases are mostly fueled by FOMO. Guilty. But not too guilty because those are ingredients that I really want anyways, and can definitely put to good use. Big Lots also has an excellent food section, the Bob’s Red Mill stuff is cheaper than it is anywhere else. I was very pleased with my hemp-heart purchase. Paired with avocado, they create a lovely crust — a little crunchy, a little soft, very reminiscent of fried avocado. Only better, because I dislike hot avocado. Another purchase I was happy with this week was a bag of ground cherries from our Saturday farmer’s market. Ground cherries are relatively new to me, but I’m already crushing hard. They look delicate beneath their gossamer shell, but they are actually firm and juicy. The papery husk peels back to reveal a small golden fruit that tastes like pineapple and honey. I just cannot get enough of all this wonderful summer produce. Also, when you’re peeling them, they look like little Golden Snitches. I did have a little problem while I was shooting the cherries, though. They are toxic to cats, and Clover likes to poke her little nose whatever I’m doing. I kept having to shoo her away, and finally I gave up let her play outside so she would leave me alone. Then she climbed a tree, and looked cute doing that, so I stopped taking pictures of food and started taking cat videos. Which defeated the whole purpose of letting her out to play. In the end, I just gave her her lunch a little bit early. As a new cat mama, I’m learning that the feline-human relationship is hierarchical — and we’re on the bottom. For best results, make the dressing a few hours (or even 1 day) prior to serving. This allows the flavors to mellow and mingle. If your strawberries are extra sweet, you might may want to omit the maple syrup. This dressing lasts about a week in the fridge, and makes way more than is necessary for this salad -- so you'll be able to enjoy it on other summer goodies as well. This recipe can be eaten as a main meal for one, or as a side salad to share between two. Turn on the broiler. Once hot, place the corn directly under the heat. Cook for for 12 minutes, turning the corn every 3-4 minutes. Allow to cool and strip off the kernels. Combine the hemp hearts and the salt. 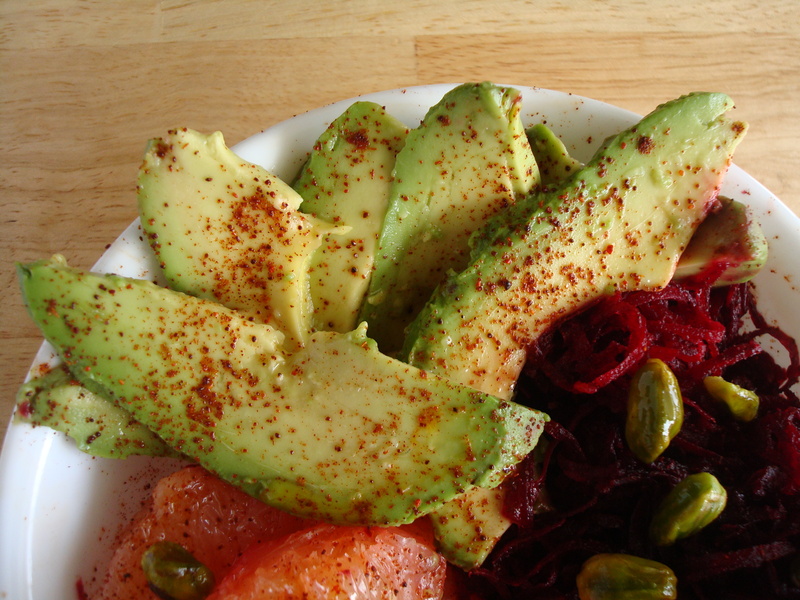 Slice the avocado into 8 pieces. Gently roll in the hemp hearts to coat. Combine the greens, the peaches, the avocado, the corn, and the ground cherries in a bowl. Drizzle with dressing. In the past few years, there’s been an ever-growing trend where all sorts of foods get their own day. National Cheese Curd Day. National Blueberry Chia Smoothie Day. National Your Mom’s Cookies Day. I truthfully don’t know if any of the aforementioned foods have their own day, and I don’t feel like Googling it at the moment. 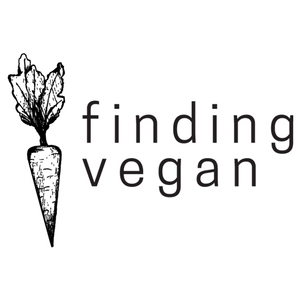 If you float around the food blog world at all, I’m sure you’ve noticed this movement. Since I am thoroughly uncool, I never notice the fad until it’s over. Or I get it entirely wrong. Tuesday was National Tater Tot Day. This really was supposed to be a Tater-Tot Thai Brussels Sprout Salad, but I clearly missed the target. Ain’t no sharpshooter. I was on my way home from my fieldwork/residency on Friday, thoroughly exhausted, but I needed to stop at the grocery store first. I was only going to make one stop, and if they didn’t have what I needed, I was gonna deal with it. Well. They didn’t have what I needed. They did have three brands of tater-tots, all of which contained ingredients that were off-limits to me. Fine. I’d been feeling kinda heavy lately, and tots weren’t going to help that problem. I chucked a can of chickpeas into my basket and left. And I’m really glad I did. Instead of being a heavy carby side dish, this became a tasty protein-laden salad. I used my quick-roast method of cooking Brussels sprouts, wherein I nuke them for a few minutes before tossing them under the broiler. Also, you can broil them naked — by which i mean sans coconut oil — and still get a crispy result. Not as crispy, but still toasty on the outside and soft in the middle. I roasted the chickpeas for good measure. 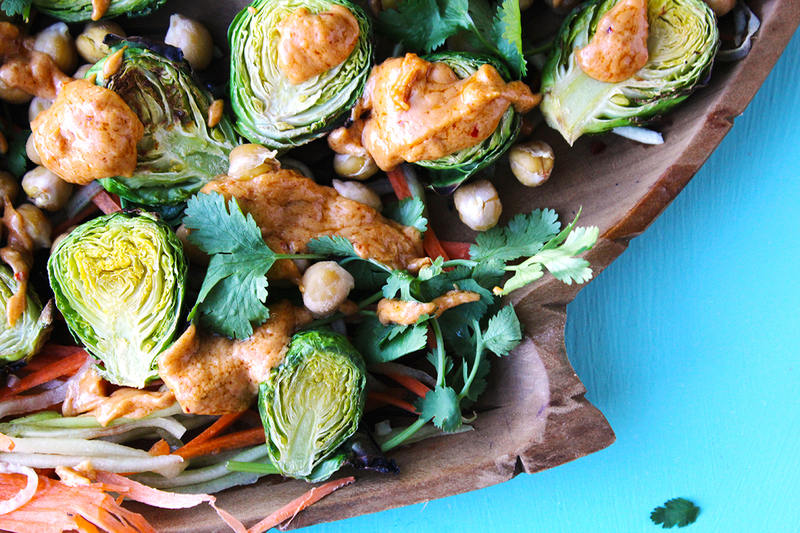 The spicy Thai peanut sauce is probably my favorite part of this dish. Which is odd, because usually my favorite part of a Brussels sprout dish are the sprouts. 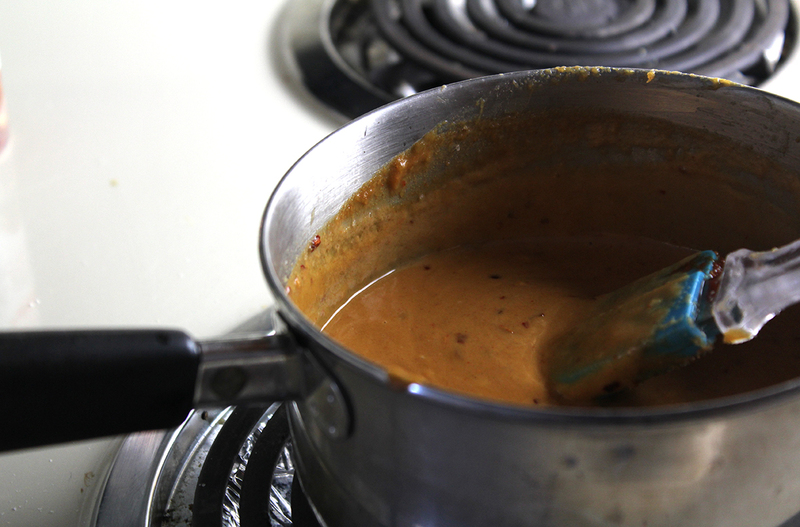 But this spicy Thai peanut sauce is thoroughly addicting. The recipe makes more than you will need for the salad, but it makes an awesome sandwich spread/taco filling/spoon filler. Is there a National Thai Peanut Sauce Day? Yeah. There is. It’s today. Warm the water in small saucepan over medium heat. Stir in the peanut butter. Allow the chickpeas to cook for another 2.5-3 minutes, and the srpouts to cook for another 3 - 4 minutes. 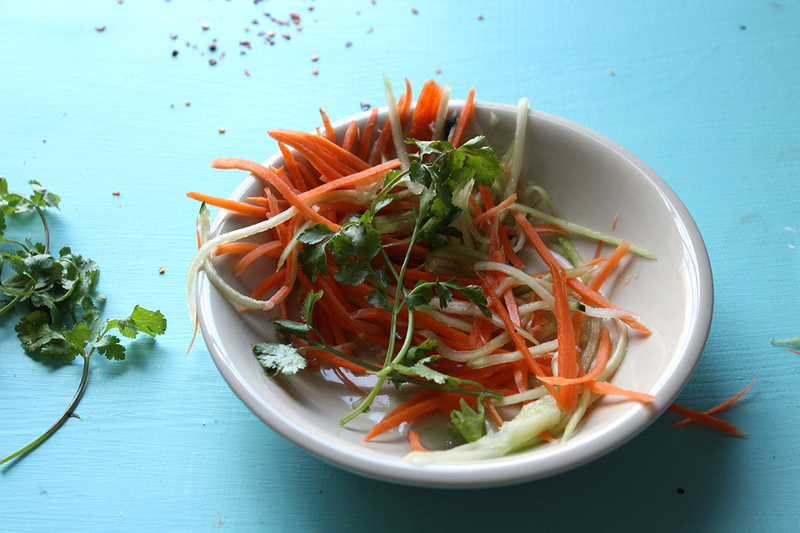 Toss the carrots, cucumber, chickpeas, and sprouts together. Spoon the peanut sauce over top, garnish with cilantro. Ah, but Annie, um….this isn’t real grape salad. Truth, but grape salad isn’t real salad. I first sampled grape salad this past July at a baby shower. It was my second day in Ohio, so I mentally classified it as a Midwestern dish. I want to tread carefully here, since a highly respected publication made a similar declaration a year or two ago, and received a harsh scolding. Even though I still miss Raleigh terribly, I promised Jason that I’d work harder at being comfortable here. Thus the grape salad. It’s a piece offering to Ohio. Sort of. It’s also a very New Year’s dish. Eating 12 grapes at the stroke of midnight is apparently a Spanish tradition, one grape for each month to bring you good luck. Probably thought up by some genius parents who didn’t want to share their vino. Hey why don’t you kids eat some grapes and then go to bed, mmmkay? I don’t know why Spanish parents sound like Mr. Mackey from South Park. It just seemed to fit. Traditionally, grape salad is supposed to have sour cream and cream cheese, pecans and walnuts and heaps and heaps of sugar. I traded the sour cream and cream cheese for nonfat Greek yogurt, and traded the nuts and brown sugar for….uh…. oatmeal cookies. But the cookies really work here, trust me. I threw the Greek yogurt into the ice cream churner with a little bit of lemon juice and sugar, and it came out tasting exactly like the tart flavor from the yogurt shop. I only ever get tart if they are out of tarro, which is my all-time fave. But tart is pretty good too, and it’s easy to reproduce at home. The tart, cold, creamy yogurt is a perfect complement to the bright sweet grapes and the chewy oatmeal cookies. And then I threw in some nuts because salty and sweet is almost always a good idea. P.S. Happy New Year, everyone. If your 2015 wasn’t great, here’s to a fresh start. I’m ready. Combine the flour, oats, spices and salt. Add in the milk, sugar, oil, and flax mix. Combine the yogurt, the sugar, and the lemon juice. Pour into and ice cream maker and churn per manufacturer's instructions, or until it becomes the consistency of soft serve. Layer ice cream, then grapes, then cookies, then nuts. Repeat. If you don't have an ice cream maker, you can just skip that step and use cold yogurt. If you have leftover ice cream, do not store in freezer, as it will crystallize. Let it instead return to its previous state. Hey nonny nonny and a ho ho ho, did everyone have a happy holiday? I’m still over on the east coast, hanging out with my mom, cooking and eating and relaxing, and running at an old park that I totally undervalued when I lived here. In other news, I realize that I have a genetic compulsion to feed other people. The first words that my grandma would say to me upon arrival on her doorstep were invariable: “did they feed you on the plane?” Why yes, the attendant tucked a napkin into my collar before spooning me some apple sauce. And the first thing that happens when we get to my mom’s house is being showered with cookies (and thankfully beer/wine). Food is love, food is a greeting, food is manners, food is the reason for family gathering. Jason, on the other hand, grew up in a mild Midwestern home, where the purpose of food was bodily nourishment. Potatoes, sour cream, tinned broccoli and beans. Food is tidily stored in the cupboard and dilly dip is the prelude to dinner. You don’t spend all day in the kitchen, the opposite of my family’s norms. Cook and clean and then repeat. Snack were a pastime, and as the kids (i’m one of the kids) got older, wine was added to the mix. When you grow up like this, you eventually train yourself to work around the rolling feast, pass by it without swallowing each crumb. Well, sometimes. My willpower isn’t always as willful as I’d like. And Jason hasn’t had any conditioning to the constant food environment, so when my mom waves muffins and bacon his way, he won’t pass on them. What we both needed was a healthier way around the comfort meals. Like most people, I adore comfort food, but I also wish it was lighter and more nourishing. Luckily, mom mom likes greens as much as she likes cookies, so there was no fuss or objection to this alteration. Tomato soup and grilled cheeses became the addendum to the meal instead of the centerpiece. The flavors are still present, but warmly served atop greens. Filling, but still room for the Christmas cookies that might be still rolling around. Combine all ingredients in a blender until smooth. Dressing will be thick and creamy. A small pour imparts a great deal of flavor, which means you can avoid the soggy, overdressed vinegary salad. I find that gluten-free bread is often firm and hearty. It's easy to slice in half to form two thinner slices (aka slice along the crust). The thinner slices soak of cheese better and get toastier faster. They taste like cheese straws when cooked this way. Skillet -toast the sandwiches until gooey and brown, then cut into triangles and place over the salad like big croutons. One or two sandwiches is plenty. I wasn’t going to post today, on account of finals and everything. But I just needed a freakin’ study break, and it was either this or re-read I am Charlotte Simmons for the millionth time. I’d already gone for my run, but I don’t think that counts as a study break because running helps me study. So this is actually my first study break (haha). Okay. My first productive study break. (reader silently judges Annie for procrastinating) This post will be short, because, like I said, it’s just a study break. 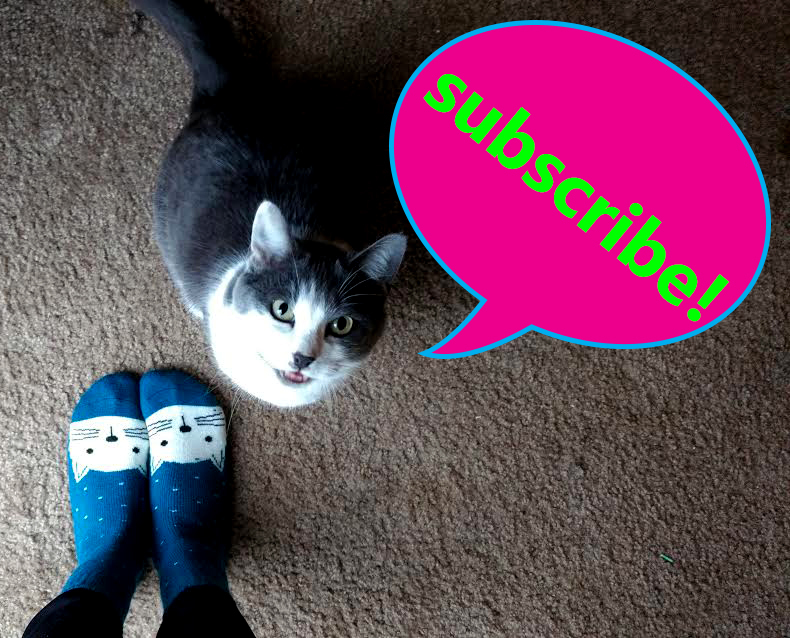 I also wanted to talk about a few things I loved around the web this week. Carla made this craveable onion dip. I’m so fond(ue) of dips, and this one is such a star. Like, if you’d brought this to a holiday party, everybody would be stalkin’ you all night for the recipe. Peabody made this cute little fudge. Since I live in the Midwest now, I guess I’m obliged to call it pop fudge, but it’s actually coke float fudge. Cool! Cheese. Jalapenos. Need I say more? Click on over to see what Holly cooked up. I already have a buckeye recipe that I love, but I’m sure that nobody around here (ahem, Jason) would object if I tried this one out. 4 Ingredient Protein Buckeyes. I know this is weird, but sometimes my favorite part of soup is the broth. I’m not sure why that is. Anyways, when I saw this soup and it’s shining broth, my mouth literally watered. Secret Ingredient Superfood Veggie Soup. Hannah’s Brown Betty. This post rang so true with my own life, but I also loved it because she talked about making something out of nothing. That reminded me of the Boxcar children books I used to read as I kid. Okay, time’s a wastin’ and I have to get back to Quizlet. Onto the recipe! I made the potatoes using the same method as the quick-roasted Brussels sprouts. A quick zap in the microwave, followed by a toast under the broiler. I adore salads with contrasting flavors and textures, and this is pretty much that. You’ve got nutty roasted potatoes, sweet-tart persimmons (though you can use pears or apples if you don’t like persimmons), a bright lemony yogurt sauce, and crisp lettuce middles. I sounds complicated, but it all comes together rather quickly. I’m not ever going to post an official recipe card for it, it’s that easy. Turn on the broiler. While it’s heating, prepare your yogurt sauce. Zest the lemon, and then combine 1 scant tsp zest with the yogurt, along with 2 tsp lemon juice and plenty of pepper and salt. You’ll still have lemon juice left over, so don’t chuck your lemon. Microwave the potato wedges for 4 minutes. While they’re cooking, make your tahnini coating: combine the tahini with 1 tsp lemon juice and the cider vinegar. When the potato is out of the microwave, spread the tahini paste on the cut sides of the potato wedges. Sprinkle some salt on and broil for 2.5 – 3 minutes. Start checking for done-ness at the 2 minute mark. Slice the persimmon. 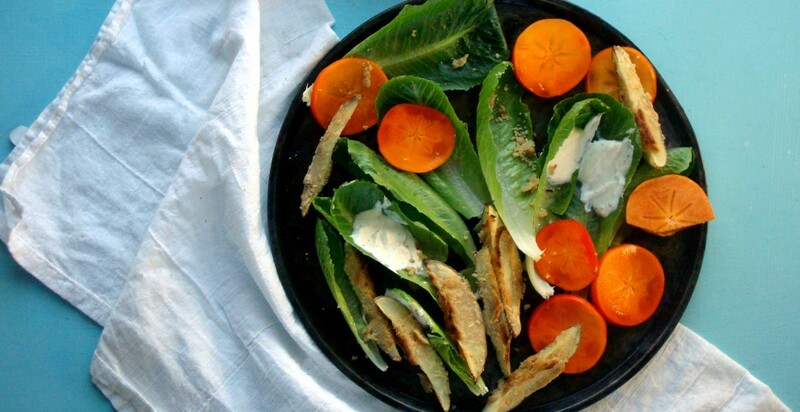 Toss the romaine, persimmon, yogurt sauce, and potatoes together. Dress with an additional sprinkle of lemon juice. Enjoy. Oh gawd, Annie is a total dork. Is she singing carols about kale? Nerd. I won’t contest the nerd/dork point, but the carols I make up to annoy my husband aren’t blog appropriate, okay?    So we’re gonna holler a little kale jingle instead. The dressing was based off a traditional wassail recipe, and because of that, it truly makes the salad sing. I know that fall produce kale salads are done a lot, but that’s because they’re wonderful. Besides, this is a warm kale salad, my favorite kind, drizzled with toasty spice citrus flavors that invoke joy. Thick socks and a good book by the fire. A trot outside on a crisp day. A smile from an old friend. This. This is what those carolers were carrying on about. Or maybe they just wanted to party. Wassail is pretty much all booze, and it you were going from door to door, you’re gonna get plastered. Which is funny, cause what about that line about being “the little children you’ve seen before?” Maybe they had a kid wassail bowl and a grown up bowl. On the other hand, it’s been well documented that kids regularly drank weak booze, as it was safer than other options. There’s no booze in this dressing, just some fresh squeezed juice and a handful of walnuts and some classic spices. Even though it’s an ugly muddy color (and my weak photo skills don’t do it any favors), I’m so in love with this dressing that I’m going to start making it year round. Why wait to the end of the year to celebrate, when you can do it every day? Roast the squash 25-30 min, turning halfway through. When you notice the squash is almost done, start preparing your kale. Put the kale in a large pot over medium head and sprinkle in a little salt. Cover the pot and allow the kale to wilt, about 4 - 4.5 minutes, stirring occasionally so the kale won't stick to the bottom. Combine kale, squash, pomegranate, and onion. Put the walnuts in a blender with the grapefruit juice and blend until you see an even consistency. This shouldn't take any more than 20 - 30 seconds or so. Add the vinegar, the sugar, and the spices to the grapefruit -nut blend. Stir well to combine. Put the dressing in a small pot and heat until just warm. Serve over the salad, with a little salt to taste. Enjoy! Spring! Peas! Asparagus! All things green! I almost don’t believe it’s spring because I haven’t been blowing my entire paycheck on tissues and Zyrtec. That, and the fact that there’s still a stubborn chill in the air. Ok, for some of you northern folks, it’s probably more than a “stubborn chill,” but you don’t need me to tell you that. I actually love the way the weather is right now. Brisk. This meal also makes me feel brisk. It’s full of happy spring time produce (and a little late winter produce). It whips up quickly, which makes it so perfect for a lazy midweek meal. And you can actually make it without a drop of added oil and it’ll still taste so good. Did I mention it has a crunchy kasha topping? I’ve been on a kasha kick lately. It’s mostly due to the fact that I wasn’t paying attention to the dispenser handle at Whole Foods and all this kasha came spilling out into my bag. Oops. I hardly ever shop there — can we agree that it’s a “treat yourself” place? I think of it that way. But anyways, it’s actually one of the least expensive items there, so I didn’t feel too bad. And I’ve been using it like mad, so it’s fine. I’m gonna have to treat myself again soon. Yep. I’m gonna need these greens come dinner time. Combine oj, thyme, and a dash of S & P.
Lay asparagus on a non-stick silicone sheet and roast for 15 minutes. While the asparagus is cooking, combine peas, lemon juice, garlic, salt and pepper in a blender until pureed. Set aside. Cook the sliced shallots over medium heat, stirring occasionally till they are just a pale gold. Add the kasha into the pan and cook, stirring constantly, until both shallots and kasha darken. 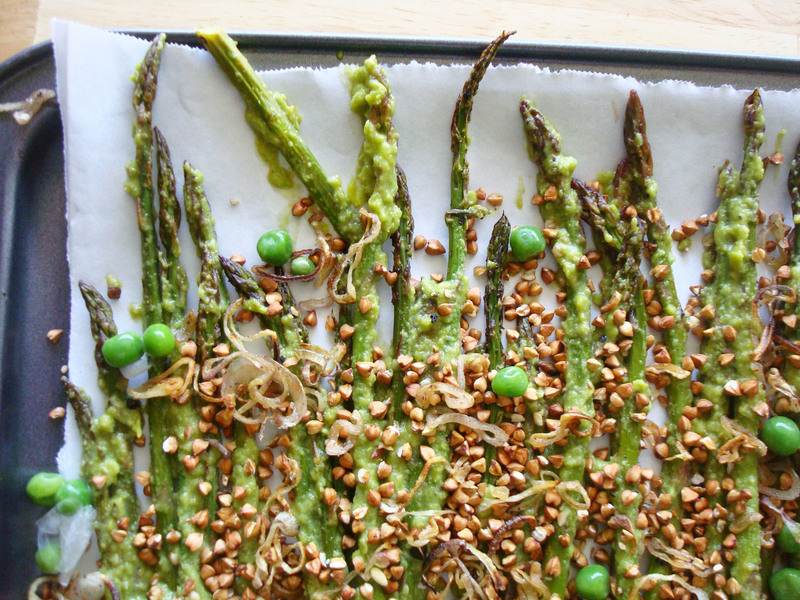 Toss the asparagus in the pea sauce. Top the asparagus with the kasha and shallots. Sprinkle a little more salt on to taste, and some additional peas for garnish. Serve immediately. There is so much about this salad that makes me happy. It has beets. 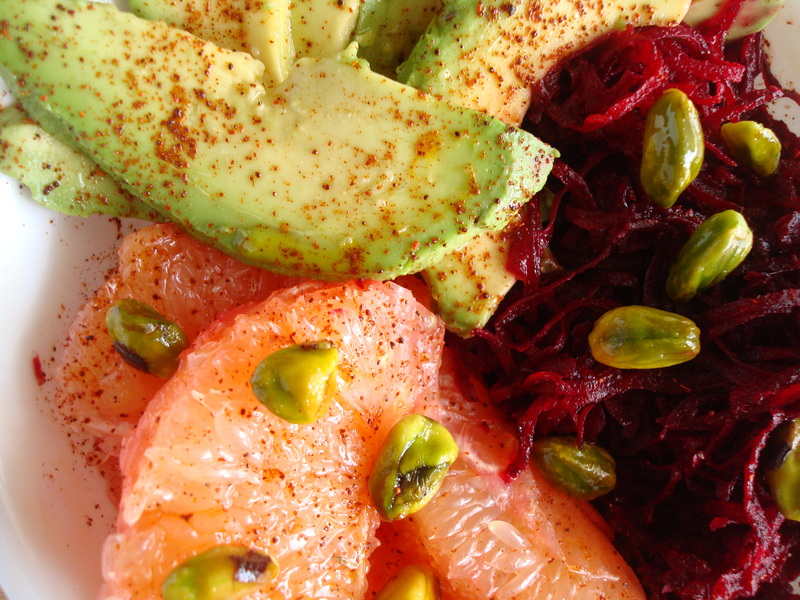 Awesome, awesome beets, which have been proven to improve athletic performance and recovery. It as a creamy, sliced-just-as-it-was-ripe avocado. Ok, the grapefruit I threw in because the two blood oranges I brought home from the store were kinda disappointing. But best of all, it has my favorite salad dressing of all time. You probably can’t even call it a dressing. There’s no prep work. It’s just lemon, chili, and salt. It’s a super classic combination that goes well on just about ever fruit or veggie or root that you could ever pick. I wanted some jicama for this too, but I’m kind of glad I couldn’t find any because this turned out so good just the way it is. I’m even glad that the blood oranges were bad because this grapefruit was bursting with flavor….you know how sometimes you can get the bland, disappointing ones? Not this. What’s even better is that I usually get bad photo luck on my day off and get stuck with a cloud cover. But the sky was bright and waiting for spring. It’s probably kind of silly to get this happy about a salad, where would be be without the everyday little things that bring us joy? 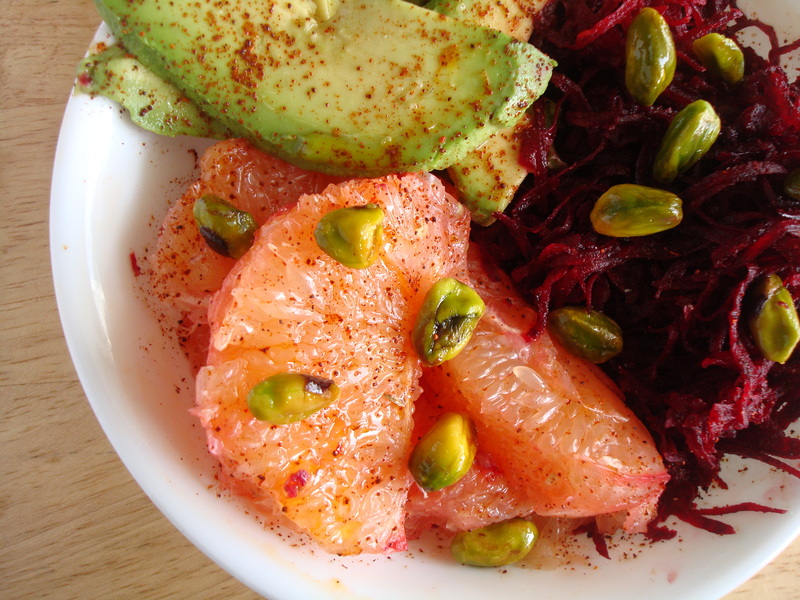 Combine all ingredients in a bowl and enjoy.